MOZART simulation of 13C-CH4 in the atmosphere. 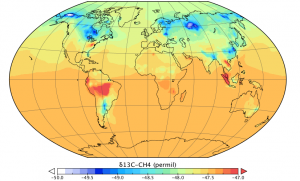 The blue areas show parts of the atmosphere with a smaller fraction of the 13C-CH4 isotope than the atmospheric average, due to near-by emissions from microbial sources. In contrast, the red areas show air that is enriched in 13C-CH4, probably due to biomass burning. Although methane is the second most important greenhouse gas its sources are quite poorly understood. 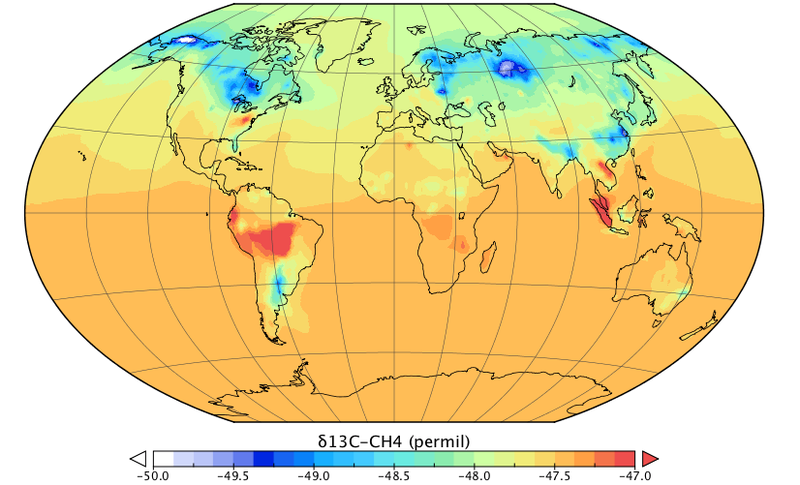 However, new methods of measuring atmospheric methane may be able to help. Methane is a molecule containing one carbon and four hydrogen atoms. These atoms usually have an atomic mass unit of 12 (carbon) and 1 (hydrogen). However, they also occur in higher masses in nature, called isotopes. Carbon-13 and deuterium (hydrogen with a mass of 2) occur in one atom for every few thousand atoms of regular carbon or hydrogen. This becomes potentially useful for us, because different sources of methane emit molecules with slightly different ratios of carbon-12 to carbon-13 or different ratios of hydrogen to deuterium. For example, methane emitted from wetlands has less 13C than the average in the atmosphere, whereas wildfires emit methane with a relatively high deuterium content. 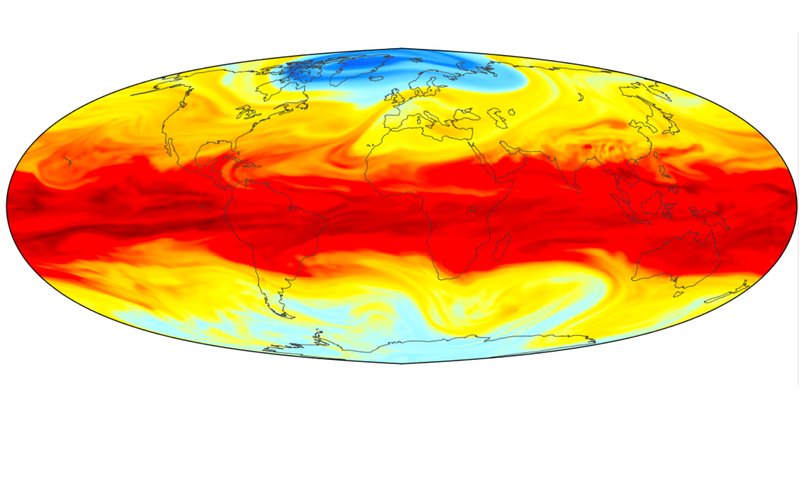 So, by measuring methane concentrations and isotope ratios in the atmosphere, we can hope to learn something more about where the methane came from. In the last few years, advances in laser spectroscopy have meant that we can now measure the isotopic composition of methane by shining lasers through a sample and measuring the absorption of certain wavelengths. However, the variations in methane isotope ratio that we expect to see in the atmosphere are very small. Therefore, to be able to resolve small changes, some people are proposing to also “pre-concentrate” air samples, which means that we remove a lot of the nitrogen, oxygen and other major components of air, to leave a more concentrated sample of methane that can be analyzed. Similar systems exist for measuring concentrations of other gases, but not yet for methane isotopes. In this paper, we asked the question: “If we had these instruments at each AGAGE station, how much better would we be able to constrain methane emissions from different sources than we can at present?”. The answer we found was a little mixed. We found that these new measurements would provide additional information about the methane emissions to the atmosphere. However, the amount by which the uncertainties in our current estimates of methane emissions would be reduced is a little smaller than we hoped for. For example, for wetlands (the single largest source) and other microbial sources, we found that global uncertainty reduction would be reduced by only around 3%. For smaller sources that had a more “distinct” source isotope ratio such as biomass burning, larger relative uncertainty reductions were possible (9%). Despite the relatively modest uncertainty reductions, my feeling is that, given the importance of methane in the global climate system, these new instruments will have a role to play in a future methane observing system. Given the complexity of the system, no single measurement (or modeling) strategy will be able to fully determine the causes of the strange changes we see in methane. However, by combining many measurement types, we should be able to understand the system better than we currently do.